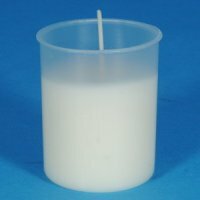 This votive light is housed in a translucent white plastic cup, approx 50 mm (2") in diameter and 65 mm (2.5") tall. and burns for 16 to 20 hours. Ideal for restaurants, weddings etc. Sold singly. Candle is burned inside the cup. For outdoor use but can be used indoors in suitable container such as a glass etc.